The Derwent, Howden and Ladybower dams and reservoirs in the Derwent valley, Derbyshire. 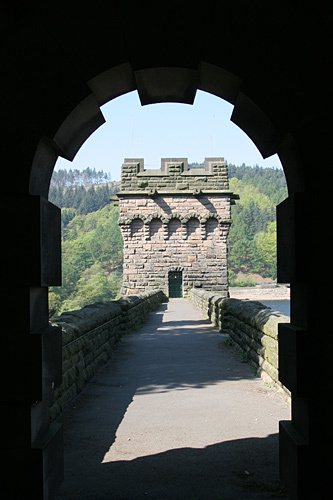 Looking through the East gatehouse towards the tower of the Derwent dam. These gatehouses are all locked except for weekends and Bank Holidays when they are opened up to the public. It is a nice view looking down from here, the East tower is not open to the public. The opposite West tower has The Derwent museum in it and is worth a visit - Sundays and Bank Holidays only.